Between Elon Musk promising to consume the world’s current production of lithium ion batteries and China pretty much outlawing internal combustion engines by the year 2020 lithium demand is set to take off. Just last year Chinese sales of Electric Vehicles (EVs) increased 223% and a 4 fold increase from 2014. 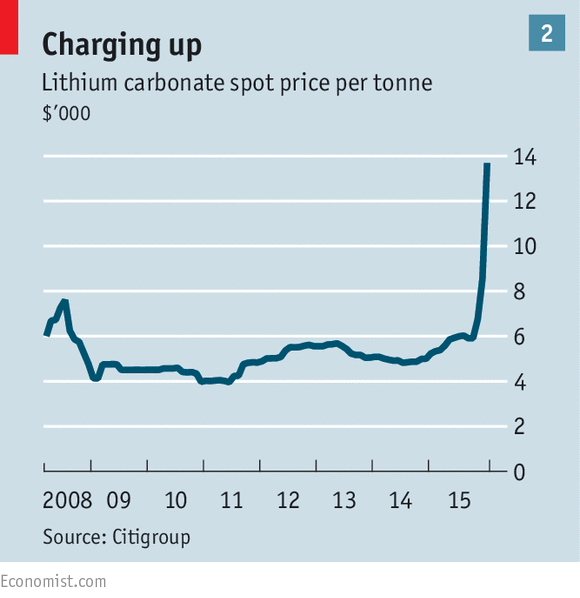 Not surprising this has led to an absolute parabolic increase in the price of lithium in China as shown in the chart below. Yeah… That’s insane. China is known to get what it wants and countries around the globe have been more than willing to accommodate their demand. Currently there are just four companies that account for the majority of lithium production which are: Sociedad Quimica y Minera (SQM), FMC Corp (FMC), Talison Lithium Ltd. Thus the additional of production needed to meet demand will have to come from mines/properties that do not yet exist. This opens up a huge opportunity for amazing returns in this space. Looking at the chart above, it doesn’t take a genius to know that 2/5 of those countries will not be invest-able for an American investor. Bolivia is not a mining/resource friendly country to outsiders and over the last decade has nationalized various industries as well as passed a 2014 law that prevents 35% of the country’s miners from working for private firms. Not to mention, Bolivian reserves are located in a moist area which slows the dehydration process as well as a very high Mg/Li ratio which further drives the cost of extraction hgiher. China is not an easy nor transparent country that I like to invest in. Which leaves Chile, Argentina, and the US. The US has one major deposit, Clayton Valley, in Nevada and an unproven one in Utah. For now I’ll focus on the Clayton Valley where speculative companies have acquired rights to the land around it, hoping to stirke it rich. To my knowledge so far, one company, Pure Energy Minerals, has found a relatively low grade 800,000 tons of reserves in the surrounding area. Which is nothing to scoff at, however it pales in comparison to the untapped resources down in Argentina and Chile. And that is exactly where I’m focusing my attention. On small exploration companies with good claims and if they also happen to be speculating around Clayton Valley as well then that’s a bonus. I also am interested in SQM, the Chilean company who as of now has 22% of its revenues coming from lithium, which is small but they’ve already partnered with Western Lithium to help them develop their project and we may come to expect a lot more of that as they have the technical know how and local resources to get these jobs done. Now it’s not all sunshine and roses. There are road bumps and Argentina still doesn’t have the most prestigious record on the earth. Also with rising Lithium prices, and a historically greedy government, Argentina may swoop in and tax more of a company’s profits. China’s economy is slowing down and although betting against them hasn’t been successful that doesn’t mean the future will be more of the same. And lastly, it’s an understatement to say that Elon Musk and Tesla have lofty expectations. Currently, Tesla makes less than 50,000 cars/year. Expecting to produce and sell 500,000 cars/year within 4 years seems quite ambitious to say the least. I know he’s building a gigafactory and wall street toured it and loved it but Tesla still has a long way to go. Lastly there’s the threat of future innovation. With high prices comes high incentive for innovation. Although lithium ion batteries have dominated the space for more than a decade, it’d be foolish to think that dominance will last forever, especially in a world of big data, AI, and high incentives.